Jonathan released N34bn to dredge River Niger but Buhari will do same project for N100m – Amaechi – Royal Times of Nigeria. 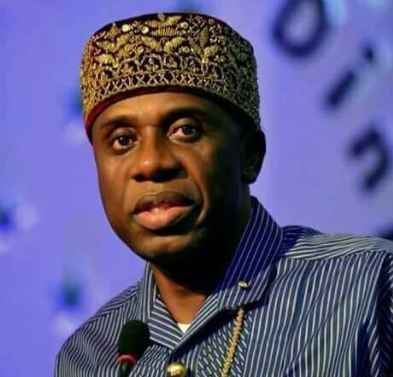 Minister of Transportation, Rotimi Amaechi has said the administration of former President Goodluck Jonathan released N34bn for dredging of River Niger while the APC led administration will spend only N100 million to do the same project. The minister made the disclosure while speaking at a conference on ‘Fast-tracking Port Reforms’ hosted by The Nation Newspapers in collaboration with the ministry of transportation and Epsilon Limited. Amaechi said; “When the River Niger was first approved for dredging by the previous administration, it was approved for N47billion and N34billion was paid to the contractor. Dancers were called in and there was a party,”. “We are not dredging the River Niger with billions of naira; we are dredging the River Niger with just N100m. When we flagged it off recently, did you see us dancing? Was there a party? I just went to see the governor and told him that the project will start today and will be finished in one month. “The governor said he will accompany me, and I said ‘ok’. So, I asked the governor to flag it off since it’s located in his state. “People are wondering how on earth we are going to dredge the River Niger for N100m when the previous government awarded same contract for N47billion? But we are going to dredge the River Niger, using dredgers owned by the National Inland Waterways Authority (NIWA).